Playing a casino game always includes a high level of risk which is one of the things that makes gambling so exciting and entertaining. Thus, players should always manage their funds properly and play responsibly in order to be able to fully enjoy blackjack. The reason why it is so essential to have money management skills and discipline is that without them, it is not possible to make the best betting choices or retain any profit. Having self-control is an extremely valuable quality as it enables players to make wiser decisions for their money. For instance, disciplined players are capable of walking away from a blackjack table when they are losing, whereas gamblers who lack self-control find it very hard to leave the game under such circumstances. This is the reason why it is extremely important to be able to successfully manage their bankroll and to determine the exact amount of money that is acceptable to lose for a particular session. One of the most important things that players should always take their time to consider prior to playing is their bankroll. It is crucial to be able to manage their funds at any point during the game as otherwise they risk losing money in the long term. In general, players should always decide the exact amount of money they will take, before going to a casino. 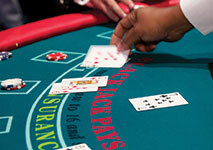 In order to do so, they need to take into account the minimum bet that their chosen blackjack table requires. Most casinos have a wide range of diverse games which offer different table minimums and thus, it is possible to find a suitable table for any bankroll. It is also essential to only take part in games in which players will be able to stay long enough to make a profit. If they fail to choose a table that corresponds to their available funds, they will most likely end up losing all of their money as they will have to leave the game too soon. For instance, if the available bankroll players have for the day is $100, then playing on a table that requires betting at least $10 or more, is simply not a good idea. Instead, they should search for a game that offers lower minimum wagering limits such as $1 or $5. Besides the minimum required bet set on every blackjack table, it is also important to have a look at the maximum amount that is allowed for each wager. The reason why is that this way players have more options to choose from when it comes to placing a bet. It is also worth mentioning that if they don’t bring a decent bankroll, it won’t be possible to apply the basic strategy properly. The available funds that players have for a particular session play a crucial role for their financial decisions during the game and determine to a huge extent the potential profit that can be made. They should always take only the money that it is acceptable to lose, meaning that if the worst case scenario occurs and players lose, the respective amount won’t have a negative impact on their lives. The better players manage their bankroll, the longer they will be able to stay in the game and play. Many players don’t follow a money management strategy as they believe that this can ruin all the fun from playing. However, nothing could be further from the truth as implementing a reliable plan will only increase their chances of winning and thus, their level of excitement. Blackjack is a skill-based game and as such, it offers players the unique opportunity to decrease its house edge by using their skills and knowledge. Thus, it is possible to make a profit in the long term and retain their winnings as long as they have a money management strategy. In order to be able to lock in their profit, players need to utilize a well-established plan for their funds. 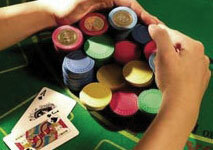 This way, they will be able to save up their winnings on a regular basis and at the same time, enjoy playing blackjack. This is the reason why before playing players need to divide their bankroll, depending on the number of sessions they would like to play. For instance, if their bankroll is $500 and they decide that they will play at two tables their available money for each game will be $250 which is a moderately decent amount. In order to take care of their winnings properly, every time players win a hand, they should divide it into two equal parts. The first one they can use to continue playing and as for the second one, it is best to be set aside. This money management strategy has proven to be very efficient as it enables players to always keep half of their profit. In the gambling world, the amount that goes back in the game is known as Excess and the money that are put away – Guarantee. Another very important thing that players need to do before they start playing is to set a win goal and a loss limit. This way they will be able to manage their funds successfully and make better betting decisions which will inevitably have an overall positive impact on their game. It is essential to strictly adhere to them in order to get the most out of every game. The win goal and the loss limit can be defined as dynamic due to the fact that they change every time the players’ bankroll is different. In additional, it is really important that they are set in accordance with the available funds gamblers have for the day. Whenever they reach their loss limit or in other words, the amount that it is acceptable to lose, they should be able to leave the game. In general, it is considered a good idea to withdraw from a game when players are on a losing streak in order to prevent themselves from even bigger losses. Contrary to the popular belief, leaving a blackjack table when players are ahead is just as difficult as adhering to the set loss limit. In fact, it can be even harder to do so as the overwhelming feelings of excitement and entertainment have a huge impact at that time. However, in order to be able to successfully retain their winnings, it is essential to follow a money management strategy. Most experienced gamblers advise to set a win goal that is no more than 20-30 percent. The reason why they don’t aim at any higher percentage is that they are aware of the fact that at any point during the game, their chances of winning are always 50-50, regardless of their chosen strategy. It is also worth mentioning that once players start winning they shouldn’t increase the size of their bet, unless their strategy calls for this move, as there is no guarantee that their next hand will be a winning one. When it comes to money management, discipline plays a crucial role. Without it, players won’t be able to follow their strategy or retain their winnings. If they fail to implement their plan, they are bound to lose all of their money and surpass their loss limit. As a result, many players get frustrated and try to make up for their losses by wagering even larger amounts recklessly. Unfortunately, these cases are not as rare as one may think as there is even a term that describes them – ‘steaming’. The consequences of steaming are always the same – players end up losing all of their money, even more than they could afford. Lacking the ability to control their choices and funds when they are losing several consecutive hands, usually results in spending a substantial amount of money. The truth is that if they try to rectify their losses by betting more, in most cases they achieve exactly the opposite effect. This is also the reason why it is recommended to never bring any credit or debit cards in the casino. Players are advised to carry only cash as this way, if they fail to follow their loss limit, in the worst case scenario the maximum amount of money they can spend will be the bankroll they brought. Having a decent bankroll and money management skills is just as important as knowing the basic strategy and the rules of the game. 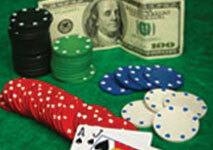 Gambling is one of the most popular sources of entertainment and it is undoubtedly a very exciting activity. However, in order to manage to fully enjoy blackjack and make the most of every game, it is essential to follow a money management strategy. This way, players will be able to retain their winnings and play their favorite game for longer.